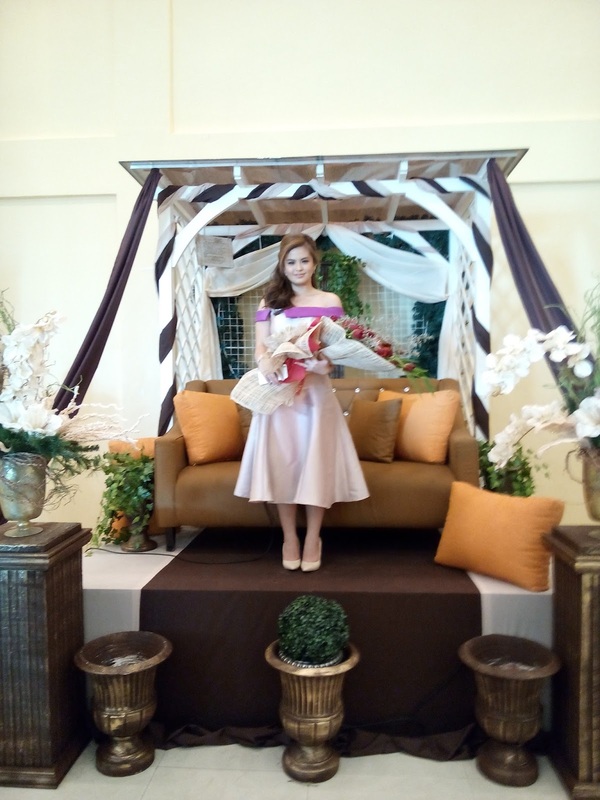 Bea Binene turns 18. I was invited for a mini conference presenting her to the media as soon to be adult. Bea is very much excited for her upcoming debut, she said she is a bit stressed about her weight because she thinks she is not thin enough, but personally I think she's fine, and she looked blooming. She will be having a total of 150 guests composed of both showbiz and non-showbiz friends. she says its gonna be a reunion of sort for her long time batch mates in the business. Bea is also included on the show "Good News" from GMA News TV channel 11 in which my husband loves to watch her. With her busy schedule, she still manages to do her job but right now she can't no longer join the crew in visiting famous spots and food trips so most of the time she is doing Voice Overs. Oh, who would've thought this little cutie pie is now entering the adulthood. Asked what possible changes could she be doing now that she's turning 18? Bea says, she wanted to learn how to drive and possibly be allowed to drive on her own and also to sleep in her own room. simple things that would make her adulthood a little different than the usual. But what I liked most about her is that, she knows her limitations, she knows that entering this new chapter in her life doesn't give her all the freedom most teens would want; a very well said statement. Let's all wait for the unveiling of this beauty inside and out lady as she soon will be an adult. ASUS Philippines announces the 23.8-inch Zen AiO Pro Z240IC, the first models in the incredible new Zen AiO Pro Series, a premium range of all-in-one PCs that fuse art with industry-leading technology. Zen AiO Pro provides a perfect balance of beauty and performance for the ultimate all-in-one computing experience. Featuring a stunningly-elegant all-aluminum design, Zen AiO Pro looks amazing. But the beauty is not just skin-deep, with superb performance delivered by 6th-generation Intel® Core™ i7 processor and gaming-grade NVIDIA® GeForce® GTX™ 960M graphics with up to 4GB of video memory. Other leading-edge technology showcased in the Zen AiO Pro Series includes the latest USB 3.1 Gen 2 Type-C port, up to PCIe® 3.0 x4 M.2 SSD storage. For truly-immersive family entertainment, both new Zen AiO Pro models are equipped with a powerful six-speaker ASUS SonicMaster Premium sound system that delivers 16W of incredibly rich and clear stereo sound. Zen AiO Pro deserves to be the computing centerpiece of any home or creative workspace, with full connectivity across all devices allowing it to become the ultimate digital hub for work or play. Zen AiO Pro is a masterpiece of craftsmanship and design, with a slim and elegant unibody shell forged from a solid block of anodized-aluminum, with a precision-crafted matching integral stand. The smooth, sophisticated appearance is enhanced by a layer of edge-to-edge glass covering the display, and the rear cover has a beautiful fine brushed-metal finish that perfectly complements the signature spun-metal Zen-inspired concentric circles on the front fascia. The extraordinary Zen AiO Pro is built to provide out-of-the-ordinary performance for discerning home users. Using the latest generation of quad-core Intel Core up to i7 processors, combined with 16GB of the very latest DDR4 memory and lightning-fast up to PCIe® 3.0 x4 M.2 SSD storage, Zen AiO Pro has power to spare for instant responsiveness and ultra-smooth and immersive entertainment. Dedicated NVIDIA® GeForce® GTX™ 960M gaming-grade graphics with up to a class-leading 4GB of video memory ensure users can enjoy superb stutter-free high-resolution movies and videos in vivid, lifelike colors, or play even the very latest games at full resolution with high quality settings. Zen AiO Pro is the world’s first all-in-one PC to use the next-generation USB 3.1 Gen 2, which delivers blindingly-fast data transfers of up to 10Gbit/s —twice as fast as USB 3.0, and over twenty times faster than USB 2.0. With these speeds, even the biggest data transfers take no time at all. Zen AiO Pro uses the latest USB 3.1 Type-C connector for improved ease of use — the connector is reversible, so it can’t be inserted the wrong way round. And for all-device connectivity, Zen AiO Pro also has a full complement of 4 USB 3.0 ports plus a USB 2.0 port, along with the latest ultra-fast 802.11ac Wi-Fi. Zen AiO Pro is designed for the ultimate multimedia entertainment, with up to a stunning FHD 10-point multi-touch IPS display for vibrant, pin-sharp visuals that make every detail visible, along with wide viewing angles and ultra-responsive touch interactivity. Zen AiO Pro also has a color gamut of up to 100% sRGB, which ensures accurate, rich and vivid color reproduction. The incredible audio system has a total of 6 speakers that deliver rich and clear full-range sound. Each 8-watt stereo channel uses three powerful speakers located at either side of Zen AiO Pro, giving fully-realistic stereo separation and a total of 16 watts of pure, undistorted sound for an amazingly-lifelike experience. The state-of-the-art technology in Zen AiO Pro ensures an awesome entertainment experience, whether users are watching the latest blockbuster movie, enjoying games or simply relaxing with music.